100 MHz Digital Storage Oscillosope with logic analyzer 100 MHz Digital storage oscilloscope of the latest generation with 16 CH logic analyzer and 7,8” TFT color display, high resolution, backlight and USB function benefits faster and larger data communication. The current electronic products become more complicated as the number of digital circuits and universal serial bus increase; the testing signal often mixed by analog and digital signal so the engineer would like to get than test instrument could test both the analog and digital signals. Provides versatile applications for educations, training centers, repair and maintenance and satisfies increasing needs of higher performance. 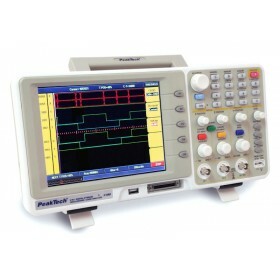 200 MHz/2 CH Digital Storage Oscilloscope with 66 MHz/16 CH logic analyzer 200 MHz Digital storage oscilloscope of the latest generation with 16 CH logic analyzer and 8”-TFT- color display, high resolution, with backlight and USB function benefits faster and larger data communication. The current electronic products become more complicated as the number of digital circuits and serial bus systems increase; the testing signal often mixes analog and digital signals, so the engineer needs a test instrument, that could test both of analog and digital signals. Provides versatile applications for educations, training centers, repair and maintenance and satisfies increasing needs of higher performance. 32 CH Logic Analyzer with USB and RS-232C This digital logic analyzer provides basic functions, easy operation and a new type of data acquisition to monitor and measure digital signals into digital information processes. This unit realizes the design and troubleshooting of digital systems, as well as to analyze transmission delays and represents the result of the information processing of the digital circuit and bus technology.